In 2011, VPI received more than 62,000 canine claims for ear infections, the most common cause for taking a dog to see a veterinarian. The average claim fee was $98 per office visit. For cats, a bladder infection was the most common reason to take your kitty to the veterinarian. VPI received more than 3,800 medical claims for this ailment – with an average claim amount of $233 per office visit. The most expensive canine condition on the list (non-cancerous skin growth) cost an average of $220 per visit, while, for cats, the most expensive condition (lymphosarcoma) cost an average of $426 per visit. Pet owners should familiarize themselves with their pets’ daily routine in order to identify abnormal behaviors that might indicate an injury or illness. In addition, regular semiannual physical examinations by a veterinarian can help prevent and identify certain conditions before they become serious or costly. With more than 485,000 pets insured nationwide, Veterinary Pet Insurance Co./DVM Insurance Agency is the No. 1 veterinarian-recommended pet health insurance company and is a member of the Nationwide Insurance family of companies. Providing pet owners with peace of mind since 1982, the company is committed to being the trusted choice of America’s pet lovers and an advocate of pet health education. VPI Pet Insurance plans cover dogs, cats, birds and exotic pets for multiple medical problems and conditions relating to accidents, illnesses and injuries. Optional CareGuard® coverage is available for routine care. Medical plans are available in all 50 states and the District of Columbia. More than 2,700 companies nationwide offer VPI Pet Insurance as an employee benefit. Policies are underwritten by Veterinary Pet Insurance Company in California and in all other states by National Casualty Company, an A+15 rated company in Madison, Wisconsin. Pet owners can find VPI Pet Insurance on Facebook or follow @VPI on Twitter. For more information about VPI Pet Insurance, call 800-USA-PETS (800-872-7387) or visit petinsurance.com. HAWS, the Humane Animal Welfare Society of Waukesha County, announces activities, seminars…and the coming of the Valentine’s Puppies to the shelter’s adoption ward this April! HAWS’ Valentine’s Puppies will enjoy a night of socialization with local children as part of Puppy Movie Night on Friday, April 6th. The 15 mixed-breed pups, born to mom Champagne in February, will soon be ready to leave the nest! Those interested in adopting one of the pups should call 262-542-8851 or stop at the shelter to fill out an application. Read all about the pups at their blog at thevalentinepups.wordpress.com. Raise funds on foot or online: The Friends of HAWS present the 29th Annual HAWS Pet Walkathon on May 5th from 9:00 a.m. – 3:00 p.m. Pets and their people will “high tail it” to Sussex Village Park for a day of adoptable pets, dog demos, activities, treats and fun for the entire family. Participants are encouraged to collect pledges or set up a personalized fund-raising webpage to help – 100% of donations raised at the Walkathon are used for animal care and programs at HAWS. All the details are available at the special Walkathon webpage of www.hawspets.org. Support the HAWS cause! HAWS’ Mobile Adoption Center “brings happy tails” into the community, including regularly scheduled stops at local Petco and PetSmart stores. Check out the entire month’s Mobile stops at hawspets.org. · “Keep Your Puppy & Your Sanity” on April 1st or “Solve Common Canine Behavior Problems” on April 2nd – both are FREE seminars! Call Khris at 262-542-8851, x118 to register. · The Friends of HAWS monthly meeting is April 11th at 7:00 p.m. at the shelter. · Pedicures for both Cats and Small Animal are available, both at HAWS’ shelter and offsite. Check HAWS’ Events calendar for dates/locations. · Two First Aid for Pets sessions will be offered, on April 14th and 28th. Register at 262-879-0165. · GPA’s monthly meet’n’greet at HAWS is April 28th. Learn about adoption of this “greyt” breed! Details, times and registration for all HAWS events are available at hawspets.org. Rise of the Planet of the Apes triumphed, The Colbert Report’s satire hit the right comedic note, and Ellen DeGeneres outshone her talk show rivals to be among the 22 major wins at The Humane Society of the United States’ 26thGenesis Awards. Honoring the news and entertainment media for raising public awareness of animal issues, this year’s awards were presented at a gala ceremony on Saturday, March 24, at The Beverly Hilton, Beverly Hills, Calif. The event will premiere as a one-hour special on Animal Planet on May 5, with an encore presentation on May 6. Hosted by Dancing with the Stars’ Carrie Ann Inaba, who opened the ceremony alongside Uggie, the show-stealing terrier from The Artist, The HSUS’ 26th Genesis Awards recognized Rise of the Planet of the Apes as Outstanding Feature Film for examining the ethics of using chimpanzees in medical research, and bestowed the Sid Caesar Comedy Award upon The Colbert Report – for the second year running – for offering a satirical twist on the whaling issue and a Utah legislator’s proposal to kill feral dogs and cats. The Ellen DeGeneres Show picked up Outstanding Talk Show for an informative interview with HSUS President and CEO Wayne Pacelle about dogfighting and puppy mills. From a rich field of documentaries and reality series, the Morgan Freeman-narrated IMAX documentary, Born to be Wild 3D, emerged as the winner of the Feature Documentary prize for its celebration of the people rehabilitating baby elephants and orangutans orphaned by poaching and habitat encroachment, Gordon Ramsay: Shark Bait snagged best TV Documentary for its fearless exposé of shark-finning, and Animal Planet Investigates: Captive Hunting Exposed received the Outstanding Reality Series award for pulling back the curtain on the so-called sport of “hunting” tame animals trapped in fenced pens. In the world of broadcast news, ABC’s 20/20 was honored in the TV Newsmagazine category for exposing inhumane conditions at an egg factory farm; NBC Nightly News was recognized with the Outstanding National News award for multiple issues, including the fate of horses used by smugglers to cross the border, while the Morning News Show award went to NBC’s Jill Rappaport of TODAY for an inspiring series of reports on the dedicated rescuers of homeless pets. In print and online journalism, the culturally influential Vanity Fair was given the nod for an extensive look at the escalating ivory trade decimating African elephants. McClatchy Newspapers was cited for a series of articles spotlighting the inhumane treatment of chimpanzees in scientific research, and The Atlantic.com clinched the Online Award for incisive reporting on the politics of wild horse management and round-ups. For a complete list of winners, go to humanesociety.org/genesis. Deepak Chopra presented the annual Genesis Awards’ prestigious Wyler Award via video from New York to Ian Somerhalder, star of the international hit series The Vampire Diaries, for spreading the word about critical animal issues via both traditional and social media platforms. Indian media icon Pritish Nandy was honored with the International Humanitarian Award for his work in advancing animal welfare in India and for championing the country’s beleaguered street dogs. “We paid tribute to an amazing array of works that address animal protection concerns, but the real winners of The HSUS’s 26th Genesis Awards are the animals themselves, who rely on these invaluable voices to speak for them,” says Beverly Kaskey, senior director of The HSUS’s Hollywood Outreach program and executive producer of the annual Genesis Awards. The HSUS’s 26th Genesis Awards celebrity presenters and attendees included Kaley Cuoco, Bill Maher, Colbie Caillat, Ke$ha, Jason Ritter, Sophia Bush, Kristin Bauer van Straten, John Bernthal, Rose McGowan, Wendie Malick, Moby, Cloris Leachman, Fiona Gubelmann, Pauley Perrette, Michael Vartan, Wilmer Valderrama, and Uggie. The HSUS’s 26th Genesis Awards is sponsored in part by Misix, Market Development Group, The InterGroup Corporation, Hilton San Francisco Financial District, One Car One Difference, Prai Beauty Group, Tenet, Euro RSCG Edge, Honda, IMAX, Warner Bros., The Arthur E. Benjamin Foundation, American Dog Rescue and Modern Dog. On Monday, April 2, 2012, Lakeshore Veterinary Specialists will open its doors to a brand new hospital in Oak Creek. The 6,700 square foot facility offers 24/7 emergency andcritical care services with an intensive care unit, along with specialty services provided by board-certified veterinarians in surgery, internal medicine, and oncology . The hospital is conveniently located at 2400 W. Ryan Road, between 1-94 and S. 27thStreet. Lakeshore was first established in 2007 with locations in Port Washington and Racine. In 2011, Lakeshore purchased Animal Emergency Center in Glendale. Now, the Racine practice is expanding by relocating to this larger, state of the art facility in Oak Creek to better meet the needs of the community. Together, Lakeshore’s three locations employ over 110 people, and deliver world-class care with afocus on personalized service to each pet owner and referring veterinarian throughout Milwaukee and all of southeastern Wisconsin. To celebrate the opening of our new location, and to ensure that our furry friends have all the comforts of home when they’re sick or injured, the public is welcome to attend to the Lakeshore Blanket Drive on Saturday, March 31. Stop by from 9am-5pm to donate blankets, sheets, or stuffed toys, and take a tour of the new hospital . For more information on any of Lakeshore’s services, please call Charlotte Supple, Director of Business Operations at 414- 540-6710 or visit www.lakeshorevetspecialists.com. Celebrity animal lovers attended the star studded annual Burgess Wetnose Animal Rescue Awards in Knightsbridge on Friday (9th March 2012) to award, applaud and acknowledge animal rescue centres across the UK and abroad. Hosted by Wendy Turner-Webster for the 3rd year running, the awards were held at the Jumeriah Carlton Tower Hotel, Knightsbridge with Dame Judi Dench, Jenny Seagrove, Annette Crosbie, Rick Wakeman, Vicki Michelle, Rula Lenska and Sam Fox amongst the other 30 celebrities that attended. Founded and driven by not-for-profit organisation Wetnose Animal Aid, the annual Burgess Wetnose Animal Rescue Awards, recognise the valuable and endless work of small, independent rescue centres do in caring for and rehoming abandoned and unwanted animals in the UK and overseas. The awards also honour the ‘Best Rescue Centre’ for categories such as small animals (rabbits, guinea pigs and chinchillas), cats, dogs, horses and wildlife. Headline sponsor Burgess Pet Care, one of the UK’s leading producers of pet food, also gave out awards for the Best Rescue Story and the Best Rescue Pet. Andrea Gamby-Boulger, director of Wetnose Animal Aid, said: “In a time of recession, rescue centres are under even more pressure due to an influx of animals and a huge drop in donations. The work these small, independent rescue centres do is vital for many animals, but we must remember these animals are the lucky ones, many thousands are not. The Wisconsin Humane Society (WHS) has launched a new “virtual re-homing” service for people seeking a new home for their animal. The Pets Seeking People page of the WHS web site features a listing of animals in the Milwaukee area who are in need of new homes. These animals are not in the WHS shelter, but are instead in their current homes until they find new guardians. “We understand that people are sometimes faced with circumstances in which they can no longer keep their animal, but they prefer to find their companion a new home on their own. We are excited to offer this new free service to them, which also frees up more space in the shelter for animals who don’t already have an advocate,” said Angela Speed, director of community relations and development at WHS. If you are interested in listing your companion animal on the WHS website, visit http://savinglives.wihumane.org/site/PageNavigator/Rehoming. The posting and pictures will be reviewed by staff and posted within 48 hours of submission. If you are seeking to adopt a new companion, there are many wonderful animals already posted on the Pets Seeking People page, in addition to the many homeless animals at the shelter. 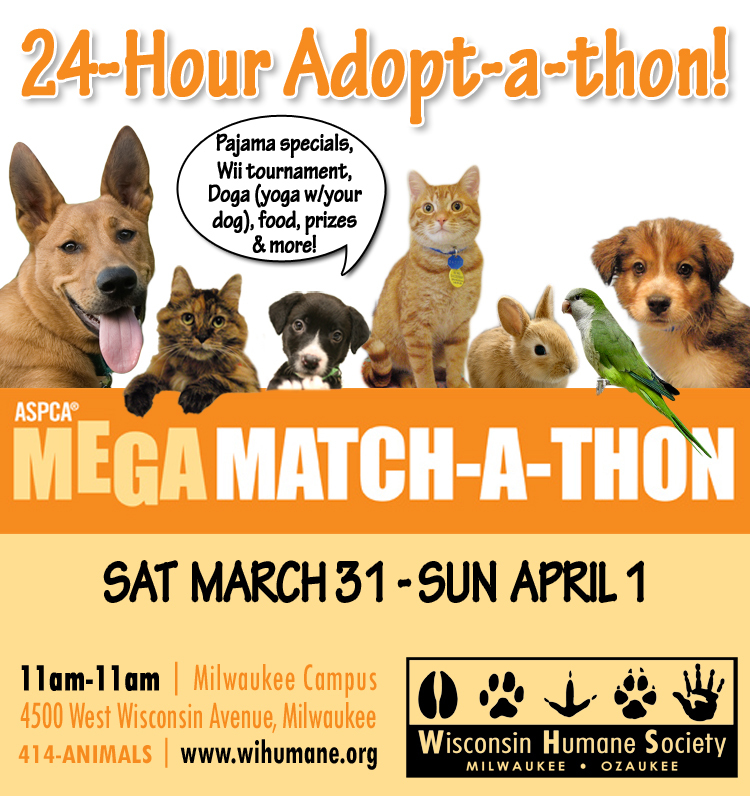 Visit www.wihumane.org for more information.